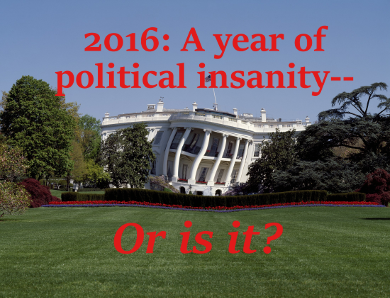 Home Commentary 2016: A Year of Political Insanity—or is it? It is a year of unprecedented extremes in the climate of presidential politics. It is a year of terrorist attacks around the world, most inflicted by Muslims upon other Muslims. It is a year that has left humanity groping for answers to the perennial question: “Why?” Satisfying answers, however, are as rare as are Tea Party voters who endorse Hillary Clinton for president. The reason why answers are so rare is that, as Albert Einstein once put it, “We can’t solve problems by using the same kind of thinking we used when we created them.” Nor can we, for the same reason, understand them. So here is my attempt to make sense of the current political situation at a different level than the seedbed from which it emerged. I ask you to bear with me, because it may appear for a while that I am not staying on-topic. Trust me. It will all come together in the end. Where did government come from to begin with? Humans have, over hundreds of millennia, come to mistrust themselves and each other in many ways. One of the consequences of this mistrust is that they have become reliant on social structures designed to maintain stability within and among groups of people, from tribes to nations and even the world at large. This wasn’t hard to do until about 10,000 years ago. Prior to that, we all lived in relatively small tribal groups, often related by blood, and social order was fairly easy to maintain by a chieftain or tribal council. But when we began to till the soil and raise animals for food, we also began to live in villages, towns, and eventually cities and countries. With the increase of the number of people who lived in close proximity came increases in the difficulty of maintaining order and stability. So we invented something called government. Initially, governments were virtually all pyramidal. That is, they had one leader at the top, and most ordinary people at the bottom, and numerous layers in between. Whether headed by an Egyptian Pharaoh, or a Mongol emperor, or a Persian Caliph, this top-down style of government prevailed for millennia. In fact, it is still alive and well in numerous parts of the Earth today. What is hardly ever noted is the shift of belief in human nature that allowed the experiment to be taken seriously. It was the first time that ordinary people—as opposed to some kind of elite class—were seen as being qualified to make decisions that affected everyone. This was the big deal. Before that time, ordinary people were considered incompetent to make such choices. The Romans had their fling with democracy, of sorts, but it wasn’t really a government “of the people,” if only because you had to be a citizen to be involved in government, and you had to own property to be a citizen, and most of those living in Rome (and the empire) didn’t qualify. Not until the eighteenth century in America did government “of the people, by the people, and for the people” emerge in anything like a pure form. Oh sure, it disenfranchised women and slaves, among others, but it was nonetheless a large jump forward from its predecessors. It came to be known as the Great Experiment. And in many ways, it was. Here again, though, the underlying change of belief about humanity got lost in the shuffle and has remained at least obscure, if not invisible, for over two centuries. I refer now to the unspoken belief that ordinary individuals are competent to make decisions affecting society at large. Why is this shift of belief such a big deal? Imagine letting five-year-olds decide who will be president, or who shall make laws. Seems crazy, right? Why? Because they are not competent to do so, at least not yet. The same goes for fifteen-year-olds. For most of the years this country has existed, even twenty-year-olds were considered not yet ready for that responsibility. Nowadays, we take if for granted that anyone eighteen or older is competent, and that everyone’s vote is equal to everyone else’s. This would have been unthinkable even two hundred years ago, let alone before that. So it is all about trusting ourselves and each other to run our collective affairs, and it always has been. For something on the order of 10,000 generations, it was believed—and perhaps rightly so—that the majority of people just didn’t have what it took to make decisions good enough to run society. Times have changed, though, and so have we, and so has our opinion of ourselves and each other. Those changes have been accelerating, like everything else, in the last century or two. And that brings us to our present political situation. What we are doing today is testing just how ready we are, as a collection of millions of individuals, to make good decisions about who we will choose to lead us, to represent us on the world stage, to choose our friends and our enemies, and to exemplify for us a moral compass we can follow with confidence. The difference this year, as opposed to previous election years, is that we have found, to run for the most important office in the land, only people whom no one really likes all that well. Everyone who has thrown their hat into the ring has brought some kind of baggage with them. One look at the most serious contenders demonstrates that beyond clarity. Ted Cruz is a religious zealot that is so far right he has to look left to find Barry Goldwater. Bernie Sanders is big on rhetoric and promises, but he would have found it virtually impossible to bring into reality nearly any of his cherished goals. Donald Trump is a frightened, angry, schoolyard bully with all the good judgment of a retarded five-year-old (and the integrity to match). Hillary Clinton is–rightly or wrongly–among the most mistrusted major politicians in decades. In the end, almost no one will be voting for someone they actually want in the White House. Most will be voting for someone they hope will keep another candidate out of the White House. But that’s not the real story. What is more interesting, and most telling, is how we arrived at this strange juncture. In simple terms, we stopped looking—assuming that we ever did—at what really matters, and have become totally transfixed by appearance (read that as “politics”). In this election year, the debates, the news coverage, the water-cooler gossip, is not as much about qualifications and policies as it is about rhetoric and unsubstantiated accusation and innuendo. For years, politicians have been moving more and more toward campaigns of attack, not campaigns of affirmation. They did so because it (at least seemed to have) worked. And it seemed that way because that is what voters responded to. They preferred to vote against one candidate rather than for another. So in the end, what will this election tell us about our state of evolution as sentient beings? Will we simply pick the leper with the most fingers? Will we choose a candidate who best speaks to and for our greatest fears and angers? Will we arrive on November ninth even more divided than we were as we raced toward it? My hope is that we will have learned something about ourselves, and each other, that we will be able to turn to our advantage in the years, decades, and perhaps centuries to come. If not, we will have endured a lot of pain for very little gain. And that would go down on America’s report card as a D- at best. Personally, I’m hoping for at least a C+. Call me a fool, but it could happen. On the other hand, I’m not going to hold my breath, either. What this election really is, however, is a referendum on America’s (and Americans’) maturity as choosers for the common good—not for the political good, nor the dogmatic good, nor the popular good, but for the actual benefit of all concerned. If we flunk, it will be the socio-political equivalent of Punxsutawney Phil seeing his own shadow on Groundhog Day. Only this winter may be extended for a lot longer than six more weeks. If you found this commentary interesting and thought-provoking, you may want to read these other articles. Who’s Pushing Everyone In? : A discussion of prevention versus damage control. On Blind Obedience: Recent studies have found that the single most common trait among Trump supporters is their belief in authoritarianism. This piece explores that subject in depth. Global Economic Stability: This link will allow you to download a free copy of the chapter entitled Global Economic Stability from my latest book, Millennial Challenges. It is an examination of the dynamics that define economic stability at a any level, including globally. Clinton, Cruz, election, government, politics, Trump, White House. Bookmark.